In case anyone is in any doubt that President Obama’s comments on the Israeli-Palestinian conflict, delivered to the UN General Assembly this morning, were nothing more than a string of worthless peace-process platitudes, then listen to the rave review he got from Israeli foreign minister Avigdor Lieberman: “I congratulate President Obama, and I am ready to sign on this speech with both hands.” Prime Minister Netanyahu and opposition leader Tzipi Livni were similarly pleased. 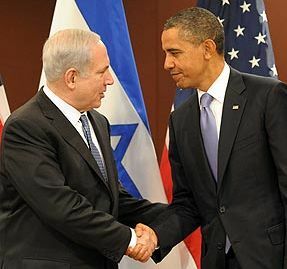 As usual Israel and the United States are speaking with one voice: Israel’s. For Mr. Obama, the challenge in crafting the much-anticipated General Assembly address on Wednesday was how to address the incongruities of the administration’s position: the president who committed himself to making peace between the Israelis and the Palestinians a priority from Day One, who still has not been able to even get peace negotiations going after two and a half years; the president who opened the door to Palestinian state membership at the United Nations last year ending up threatening to veto that very membership; the president who was determined to get on the right side of Arab history ending up, in the views of many on the Arab street, on the wrong side of it on the Palestinian issue. The US-Israeli message to Palestinians remains now what it has long been: the Palestinians deserve a state, but not just yet. So if you’re looking for Palestine, all you need to do is find your way to the end of the peace process rainbow — it’s right there, alongside a pot of gold. Those who still declare their belief that a two-state solution is the only viable solution to the conflict must move beyond their endless repetition of the parameters of such a solution and declare without equivocation when a Palestinian state must be created. Without a date there will be no state. The very abbreviated news reports about the speech this morning told the story well enough—the Security Council would happily accept the Palestinian request for recognition of sovereignty and then table it. No doubt in Obama’s and Netanyahu’s minds, until sometime a few centuries hence when some historian would find the request and wonder what ever happened to deal with it. Sarkozy is probably grandstanding again, but at least he’s standing on the right grandstand. One has to wonder about Obama, is the world right to be embarrassed for him or about him? Well, it was to be expected, wasn’t it? Now, all things being what they are, he still has a chance to redeem himself in not only the eyes of the World, but also here at home, by either abstaining the vote in the security council or voting in favor. The madness that has been taking place in the M.E. from Israel needs to cease. So, who does “O” represent? Is it the U.S.A. or Israel? I wonder, any takers on betting the farm that the Israelis wouldn’t let him live there in Israel after he’s defeated in 2012? Anybody? One gives as one gets– INEVITABLY. No matter how much Obama got away with, faking a contemplative and humane position, in the end he is a Nobel Prize thief. The presidency was the prize Obama got it for what an embarrassing fool he sounded like today at the UN instead of what the Nobel Committee was so sure he would become; he had today, once again, establish that he’s a man of no principles, no ideas and no leadership spark…just an anointed stooge by Ted Kennedy who died and left Obama flapping in the breeze with no personal sense of direction. Ted never got to be president so he had hoped to have a dummy stand in who would follow his orders. When Ted died Obama filled his entourage with Clintonistas who ably kept him swinging on a gallows of indecision which Suskind so ably documented. Once again, this reporter gets out in print an early history of our hopeless presidency to make clear why he is sinking politically while prostituting for campaign contributions. The end of the Roman Empire is in repeat mode, so sad as this nation was indeed once upon a time a light onto the world. Obama is a person with ambitions but no principles. He’d sell his own grandmother to fulfill is ambitions.